Bounce is a web-based tool which provides an easy way to comment on web page screen captures or images. Bounce allows for comments to be added and saved and bounced again by others. 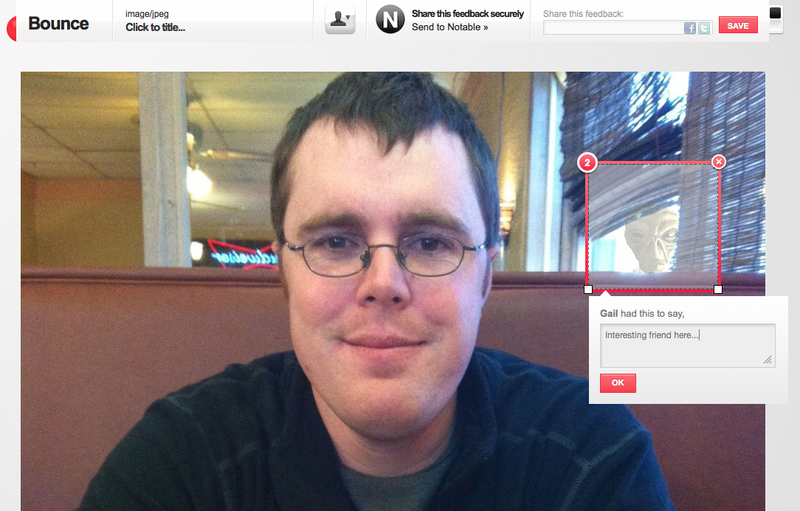 Bounce makes it really easy to share ideas, thoughts and feedback on image or web-based screenshots. Each “Bounce” will have a specific link, and can be bounced again with or without additional comments. Bounce makes it easy to add “comments” to web page or an uploaded image. In this example I chose to Bounce an image. I chose the image from my computer and uploaded it within Bounce. Once the image is loaded I have the opportunity to insert my name (or pen name). This is used to identify comments by different individuals. Then the user can drag a rectangle over areas of the image and add a comment or question. These comments are numbered automatically. The commenter’s name can be changed by entering a different name in the dropdown at the top of the window. Clicking “Save” on the top right of the window will create a link specific to this image with the comments added up to the activation of the save. You can use this link to bounce the screenshot or image with its comments to someone else. Mousing over a rectangle will have the comments appear by the area outlined. Bounce can be used to annotate websites or images… that is the most obvious, and intended use…. BUT WAIT, I have some other ideas! If I upload a piece of student artwork students can “Bounce” it to share their feedback, suggestions, ideas. If we upload a paragraph of writing (as an image or from a website directly as an URL) students can point out strengths, weaknesses or even errors to be repaired. Students could even use this as a tool to check for clarity in work. Maybe the uploaded image is a solution to a math problem. Students could mark different parts of the solution and explain others ways to solve it or ask each other questions about the process. Working on a group project? Students could use Bounce to mark important parts of online resources they find and add their notes as comments and then Bounce it to other members of their team as a sort of annotated online research packet. Little learners could be bounced an image with lots of details and use the tool to mark areas in a specific shape, or color, or maybe even select things which are alive or not-alive. Lots of uses for this very easy free tool!